Can it be noted,in the old days of royality. The royal couple usualy had seperate brdrooms. They only shared one,when it was time to make a heir or have some fun. But after that deed,they usualy slleep in there regular rooms. Naoko could be referencing to that. I better we will never know. 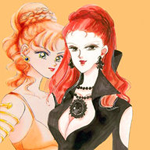 I don't think that Chibiusa is from an alternate timeline. In the end of Stars Chibiusa appears to Usagi and says that she will see her again soon showing that Usagi will give birth to the same Chibiusa. I personally think that it was just one timeline with Chibiusa going back in time happening in all timelines. I think there is a paradox named after this. As for the different designs of the grail Mrs. Takeuchi was known to play fast and loose with her designs when it fit her mood. As for Neo Queen Serenity's room I don't know maybe she referred to it as her Mother's room because she associates it more with Neo Queen Serenity and it has more of her things then King Endymion however I don't know. Either that, or she asked for someone to paint the holy grail for her and the artist painted what they saw in their mind rather than what was there. And in the page that you posted, the holy grails vanish, "never to be seen again"; the painting in Neo Queen Serenity's room is most likely a rendition. Maybe she even forgot what it looked like when she requested it be painted. There are dozens of holes in the Sailor Moon manga. We have to remember that she was under tight time crunches, and that the story wasn't given enough time to bloom. That said, I would love to see Naoko go back and actually rewrite the story to have stronger continuity and detail. I doubt it will ever happen, but it would be amazing and I'd buy every volume. Resurrecting my ancient thread because I have another question about the Holy Grail: is that its correct name? So in the manga, the item is always referred to as the 伝説の聖杯 Densetsu no Seihai "Legendary (Seihai)." The word "seihai" can be translated as either "Holy Grail" or as "Holy Chalice," which may or may not be the same thing. 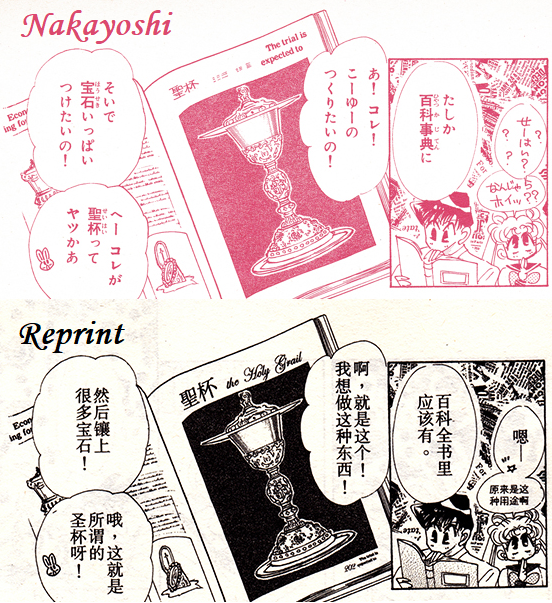 In the third Picture Collection, Naoko cites a Vatican photo book as the source of inspiration for the item. That, combined with the explanation Mamoru gives Usagi as to what a "seihai" is, suggests the item's English name should be "Holy Chalice." Likewise, the current Proplica item is called the "Rainbow Moon Chalice*," the earlier Bandai toy of the version of the item that appeared (unnamed) in Sailor Stars was called the "Holy Moon Chalice*," and the item was called simply the "Moon Chalice*" in Crystal. *They use the approximation カリス karisu which would appear to match the pronunciation of the French word "calice." Some fan sources, such as Wikimoon, render it as the Portuguese cálice. Though that word is actually pronounced differently, Weblio cites it as the loan word, though they write it "caliz" which is actually Middle English via Old French. The English word "chalice" seems to generally be approximated as チャリス charisu, but sometimes カリス is also used, so it's hard to tell whether the English or French (or Portuguese) was intended. カリス actually seems to be mostly used to refer to the Greek Charis, one of the goddesses known as the Charities or Graces, so it's just weirdness all around. But I digress. So... What do you think? Which translation is best? Holy Grail? Holy Chalice? Holy Calice? Holy Cálice? 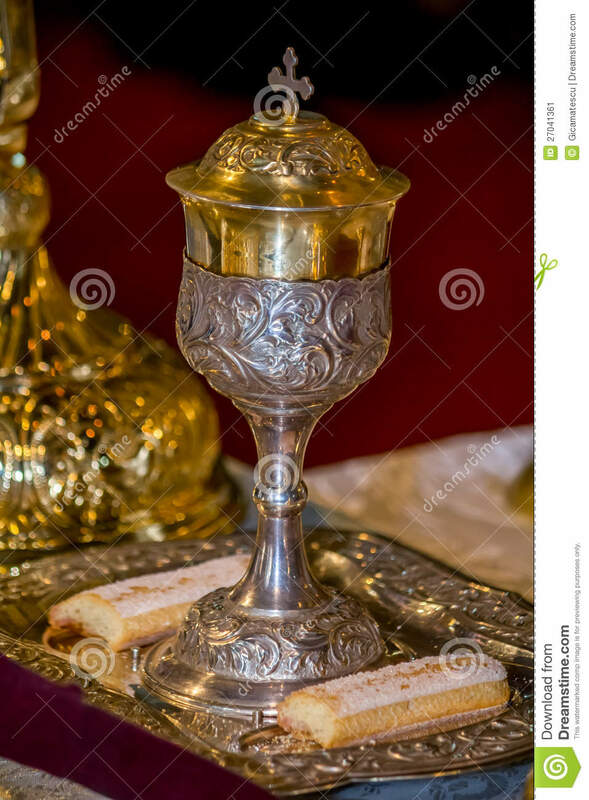 Can we also talk about the fact that the Holy Moon Chalice looks nothing like a cup? Like what did she even base that on? I think Naoko rewriting the Sailor Moon story would be a great idea as well, that is if she decides to do so on her free time as she is ccurrently busy taking of her family. But even that one, even if it was just a silhouette you can tell there’s a lid? The circular part in the manga looks more orb like. Well I guess we might get a better look when Crysta-oh wait! in the italian version of the manga Diana say:"neo queen Serenity have received as a gift the chalice when she was young"
true, i think is because the room is full of her objects and that make her jealous of everything inside of that. Maybe she have her own room but also in the palace there's another bedroom where Serenity and Endymion stay together. 3. Why does the Holy Grail in that painting not look like the one we actually see used in the manga? because after the events under the galaxy cauldron Usagi's memory become blurry, she can't remember clearly what happened in the past until that moment like sailor Cosmos said. So, i think she barely remember the appearence of the holy chalice and she gave an approximate description of that to who had done the painting. While it's unclear how time works in the Sailor Moon universe (Pluto, you've got some explaining to do! 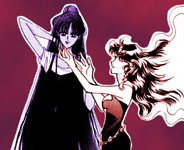 ), let's assume it works linearly and that Chibiusa comes from an alternate timeline. The presence of the Holy Grail in her timeline raises some issues. the present pluto is the one who was not awakened until the infinity arc (raised as the guardian of the time space doors but dead after Saturn attack which destroyed silver millennium), the future pluto was the one who guards the time space doors and who encounter dead after have stopped the time (probably she reborn thank to neo queen Serenity, and she stay always in the future).